10/15/18, Review by BRR - I’ve played twice this year, once in May (shot in upper 80’s) and the 2nd in Oct. (a 77 this time). Both times the course was in great shape. Green fee for seniors is $27. 6/29/18, Review by Shankapotomous - Overall this course was in great shape. For those of you that haven't given Deer Brook a chance you should find the time to make the drive. Greens were in very good shape given the rough winter and the time of year for aeration. They aerated the first week of June so they have recovered very well with no signs at all of any punch marks. Fairways were in very good shape, and bunkers were well maintained. There really wasn't anything at all to complain about the day that I was playing, short of it being slow play. That isn't the courses fault though, just happened to be how it went, but still finished in the standard 4 1/2 hours. Overall given the many other courses I have played around the area recently, Deer Brook ranks near the very top for course quality, layout, and condition. 10/17/16, Review by BRR - First time at this course. The course was in great condition - fairways - very good, greens - good, VERY soft, a little slow, lots of undulations/breaks. I had trouble reading the greens accurately so there were more than normal 3 putts. I played the black tees about 5800+ yds. Some of the par 4's the 2nd shots were a little long for me (71 yrs old - drives about 200, 3-wood about 175). ProShop attendant was very helpful. I was by myself so he started me on the back 9. It was great, didn't catch anyone for the whole 18 holes. 3.5 hours, sometimes hitting 2 balls. Since I live an hour away I probably won't be able to get back very often but this course is definitely one of my favorites in the Charlotte area. BTW the GolfPad gps app worked fine. I understand a few of the holes had been changed. 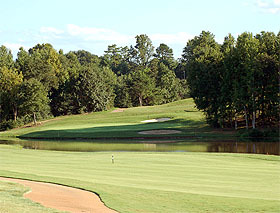 The correct website is golfdeerbrook.com. If you do a search it will bring up deerbrookgolf.net which is the old site before the renovation. 8/4/15, Review by psychgunny - Deer Brook continues to be one of the best public courses in the Charlotte area. Fun course but bring your game with you as it is long and the greens are challenging. Worth the drive. 6/29/14, Review by dongtrgolfer - First time at this course and I was very impressed with the conditions. Tee boxes good, fairways in great shape, greens as close to perfect as you will see in the area. Bunkers in good shape also. I like the layout and the dramatic elevation changes. Only negative was there was no starter so it was tough to tell when you were up and they were pretty busy. Overall on par with Edgewater but not as far for me. 5/27/14, Review by oneputt - What a treat! My first visit and the trip (40) minutes was worth every second. The course was almost empty. Kinda a special surprise on a sunny Tuesday. Where do I start? The tee boxes were the best around. The fairways not perfect, but growing in nicely. Was able to play the ball down without to many bare lies. The fairway bunkers and green side traps all had plenty of sand and were very consistent. The greens were really nice. They were smooth and the putts rolled quick. The pin placements were unusually tough for a weekday. I was impressed with how many different elevations there were on each green. Course knowledge is helpful. I didn't have any but I was lucky all the way round. I will certainly head back, soon. 5/25/14, Review by worthing - Without a doubt, this is the best course for the money in the greater Charlotte area. The conditions were almost perfect, everyone was incredibly hospitable, and the pace of play was good. The greens were better than any public course and many private courses I have played in the area. Also, on Sunday, there is an incredible lunch buffet that tons of people, who are not playing golf, come to. It's only ten dollars. My only gripe is when I called to ask about the replay rate I was told it was ten dollars but it was actually 17, ten is a nine hole replay. This place is well worth the drive. 5/31/13, Review by IM4DHERD - $25 for 18 holes (Sr. Rate - 55+) on a Friday is not too shabby, particularly for one of the best conditioned courses in the area with one of the nicest layouts. Seemed slow - played in a twosome and there was a fivesome out there and a very cute cart girl everyone was flirting with which slowed things down - but it only took 3.5 hours. I rate this place up there with Verdict Ridge, Carolina Lakes, etc. Playing lousy, so don't laugh at my score, please. 5/24/13 - Just added Deer Brook to the site so you can post your own reviews.